Famed artist Lon Megargee created The Hermosa Inn in the 1930s as his private escape before opening up to guests. All these years later, the ownership has changed, but our luxury boutique inn retains that original intimate feel, complete with homey touches: Lon’s original artwork hanging on the walls, a flourishing garden, upscale furnishings throughout. With a reputation based on warm, personal service, The Hermosa Inn is also an ideal retreat for executive meetings and social gatherings, including small weddings, birthdays, and holiday parties. 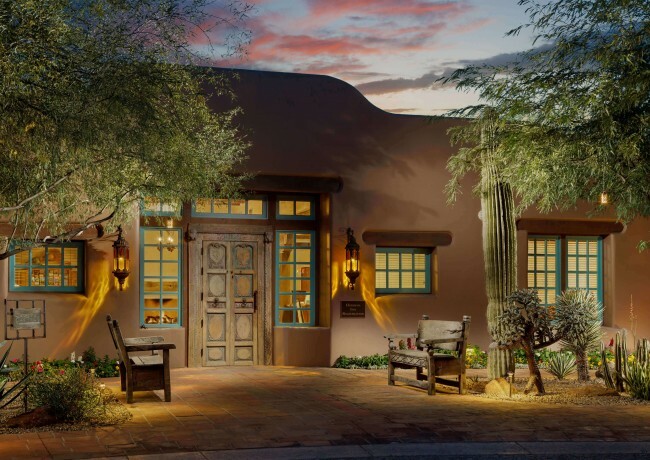 Our AAA Four Diamond restaurant, LON’s at the Hermosa, showcases globally inspired Arizona fare, with the possibility of being served on our award-winning patio near a glowing fireplace. The Hermosa Inn is located within minutes of prestigious shopping, sporting event facilities, golf, art, entertainment venues, and major business corridors of both Phoenix and Scottsdale. The Phoenix Sky Harbor International Airport is just 15 minutes from our front door. The Inn has recently completed an accommodations remodel to transform its enchanting guest casitas to a new level of sophistication and comfort.